“In the dead of night on Saturday, the Senate voted 51-49 in support of a tax bill that will either harm or provide only modest relief to all but the wealthiest families with children. Among the harmful impacts on children, the House and Senate bills increase the deficit by $1.5 trillion — a debt that the nation will be passing on to the next generation to pay off well into the future. This tax bill punishes working families by promising eventual tax increases. According to Congress’ own analysis, by 2027, households making less than $75,000 will pay higher taxes. What’s worse, in the preceding years, families with children in the lowest income quintiles will see meager (if any) tax relief compared to the thousands of dollars going to the wealthy. As an example, the tax bill will trigger budget cuts to numerous programs of importance to children, including education, child nutrition, and child welfare. While assurances were made by Senate leadership that they would protect Medicare from such cuts, no such commitments were made to protect children or the programs that serve them. Furthermore, the additional debt will put further pressure on all children’s programs, including Medicaid, CHIP, and SNAP. Recent analysis by First Focus illustrates that the share of federal spending dedicated to children has been on a steady decline and now represents less than 8 percent of all federal spending. Meanwhile, the Senate tax bill targets children for cuts in a number of ways, such as the elimination of the Personal Exemption (which harms larger families), repeal of the State and Local Tax (SALT) deduction (which harms state and local funding for public and higher education, etc. ), reduction of the Orphan Drug Tax Credit (which will disproportionately have a negative impact on kids), and elimination of the Child Tax Credit for an estimated 1 million immigrant children through the imposition of a new Social Security number requirement. Compounding these negative consequences, the Senate rejected two amendments that would have improved the Child Tax Credit (CTC) and helped millions of low-income children and families by Senator Sherrod Brown (D-OH) and Marco Rubio (R-FL), failing with votes of 48-52 and 29-71, respectively. Though 68 senators showed the will to improve the tax bill’s impact on children by voting for one or both Child Tax Credit amendments, partisan voting precluded the passage of either amendment. Children, sadly, were once again losers in the halls of Congress. The First Focus Campaign for Children is a 501(c)(4) nonprofit organization affiliated with First Focus, a bipartisan children’s advocacy organization. 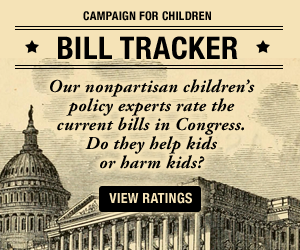 The Campaign for Children advocates directly for legislative change in Congress to ensure children and families are a priority in federal policy and budget decisions.